A 24-year old man presented with lethargy, cognitive deficits, and weakness of limbs for 10 days. He had a history of acute myelogenous leukemia and an allogeneic bone marrow transplantation (BMT) had been done a year ago. Three weeks ago, he suffered an episode of generalized tonic-clonic seizure and focal cortical subarachnoid hemorrhage. One week prior to admission, he suffered from an episode of blue fingertips, which was diagnosed as vasculitis. This time, the routine brain computed tomography and magnetic resonance imaging after admission were nonspecific. A relapse in his leukemia or the presence of central nervous system infiltration of the tumor was excluded by the hematologists. 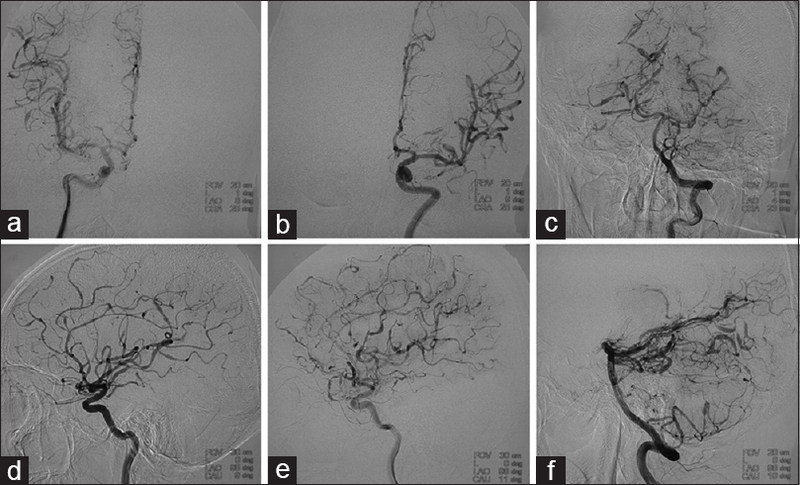 Considering the history of subarachnoid hemorrhage, a cerebral angiography was performed. The results comprehensively showed that multiple segments of abnormally dilated and narrowed distal branches of cerebral arteries were present; and, there were no stenoses in the main trunks of the internal carotid artery and the vertebro-basilar artery [Figure 1]. These results suggested the presence of vasculitis of the cerebral arteries. The erythrocytic sedimentation rate, C-reactive protein level, and investigations for infectious causes such as cytomegalovirus were normal or negative. Steroids were then administrated and the patient gradually improved. Vasculitis after BMT is known to be caused by viruses such as cytomegalovirus (CMV), and cerebral vessels can also be involved. Other causes of cerebral angiitis include cerebral angiopathy of other etiologies, cyclosporine neurotoxicity, leukoencephalopathy due to intrathecal methotrexate administration, or irradiation. Vasculitis associated with chronic graft-versus-host disease (GVHD) should also be taken into consideration. The pathological features could be described as parenchymal lymphocytic inflammation, microglia activation, and cerebral angiitis-like changes. Regarding our case with blue fingertips and no evidence of an underlying infectious focus, we suspect that the most likely cause of the angiitis-like angiographic image might have been a be a chronic GVHD. There is a reported patient whose manifestations were quite similar to that of our case. However, the definite diagnosis requires a biopsy and the assessment of an autoimmune panel including the cluster of differentiation (CD) 11a and C-C chemokine receptor type 5 (CCR5). Ethical approval was obtained from the Human Research Ethics Committee of Tianjin Huanhu Hospital and the patient consent was obtained. Takatsuka H, Okamoto T, Yamada S, Fujimori Y, Tamura S, Wada H, et al. New imaging findings in a patient with central nervous system dysfunction after bone marrow transplantation. Acta Haematol 2000;103:203-5. Padovan CS, Gerbitz A, Sostak P, Holler E, Ferrara JL, Bise K, et al. Cerebral involvement in graft-versus-host disease after murine bone marrow transplantation. Neurology 2001;56:1106-8. Campbell JN, Morris PP. Cerebral vasculitis in graft-versus-host disease: A case report. AJNR Am J Neuroradiol 2005;26:654-6. Sostak P, Padovan CS, Eigenbrod S, Roeber S, Segerer S, Schankin C, et al. Cerebral angiitis in four patients with chronic GVHD. Bone Marrow Transplant 2010;45:1181-8.